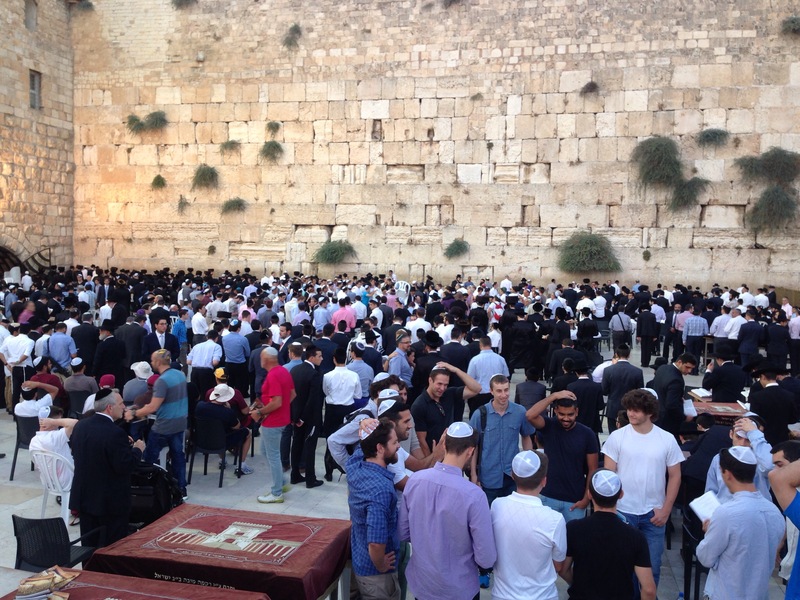 I continue onward with my Eastern Mediterranean holiday, finding myself in that place where so many histories, religions, cultures and people converge: Israel. First stop, the contested capital herself, Jerusalem. Of course, we ate hummus and falafel. Our first day was spent wandering around the Old City, which has four quarters: the Jewish Quarter, Muslim Quarter, Christian Quarter, and Armenian Quarter. While we were retracing the supposed route that Jesus took along Via Dolorosa (the Way of Sorrows) to be crucified, we stopped near the fifth station (where Simon helps Jesus with the cross) within the Muslim Quarter and had some of the best hummus in Jerusalem, so we’d heard. The restaurant was packed, so we continued onward to see all of the “sights” along the route, ending up in the Church of the Holy Sepulchre, which was built on the spots where Jesus was crucified, taken down, and buried. It was a great way to at least see parts of the Old City and learn a bit more about Christianity. By the time we finished, we doubled back and secured a spot at the hummus restaurant. And oh, it was worth it. 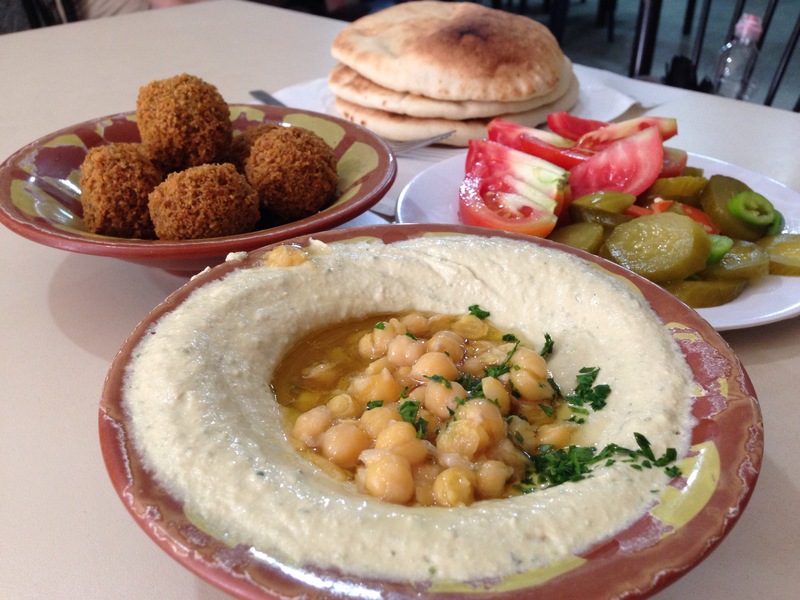 People say that eating hummus in Jerusalem will spoil hummus elsewhere for you for the rest of your life. (Quite like eating sushi in Japan.) I wouldn’t necessarily agree, but it was incredibly good. Our simple lunch of felafel (this time made with chickpeas, unlike in Cairo), pita, hummus, and pickles/tomatoes. 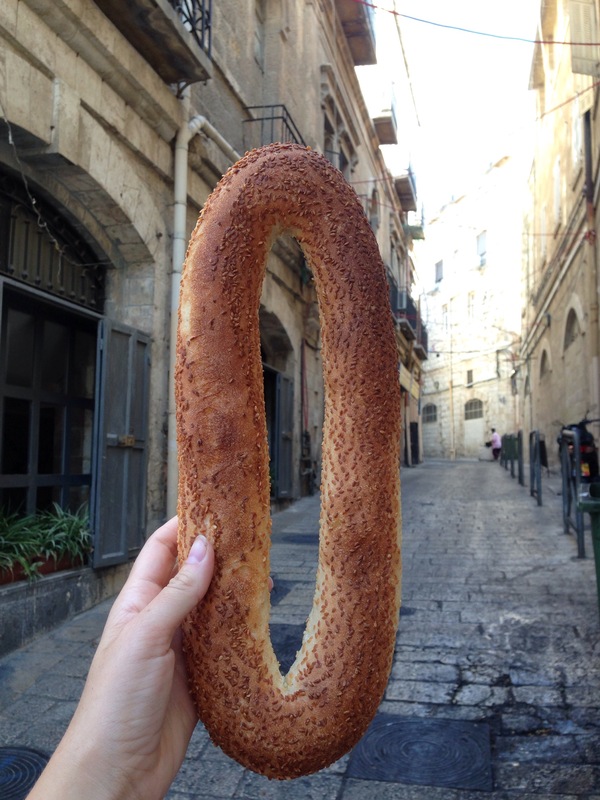 It was so filling, the perfect fuel for wandering around historic Jerusalem. I also ate more shawarma. 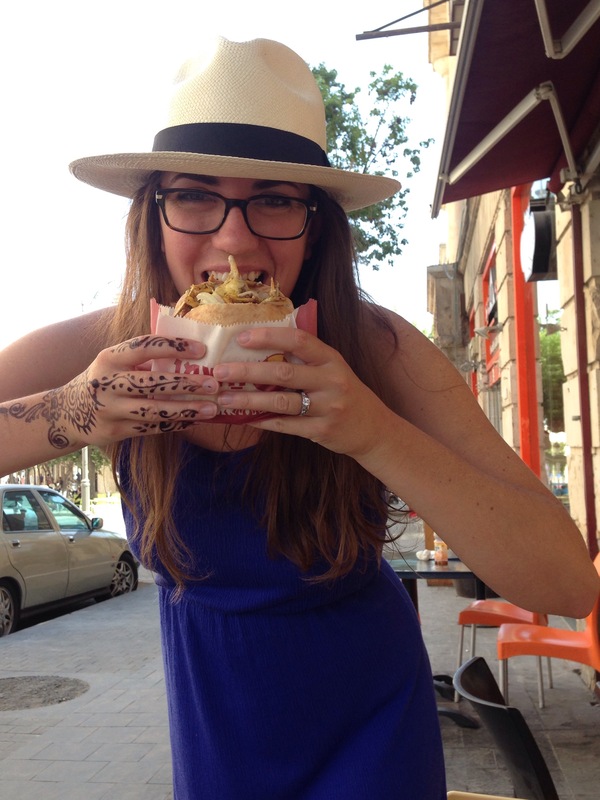 There are shawarma places everywhere, in every part of Jerusalem: Muslim, Jewish, Christian… everybody loves shawarma. It’s one of those perfect foods: pillowy ash-tanur bread (אַשתנוּר‎) filled with spiced rotisserie shaved from a vertical spit (ours here was chicken), gherkins, hummus, cabbage, lettuce, tomato, cucumber, onions. Atop, a generous dousing of tahini and skhug/harif (חריף – an Israeli hot sauce) is added. 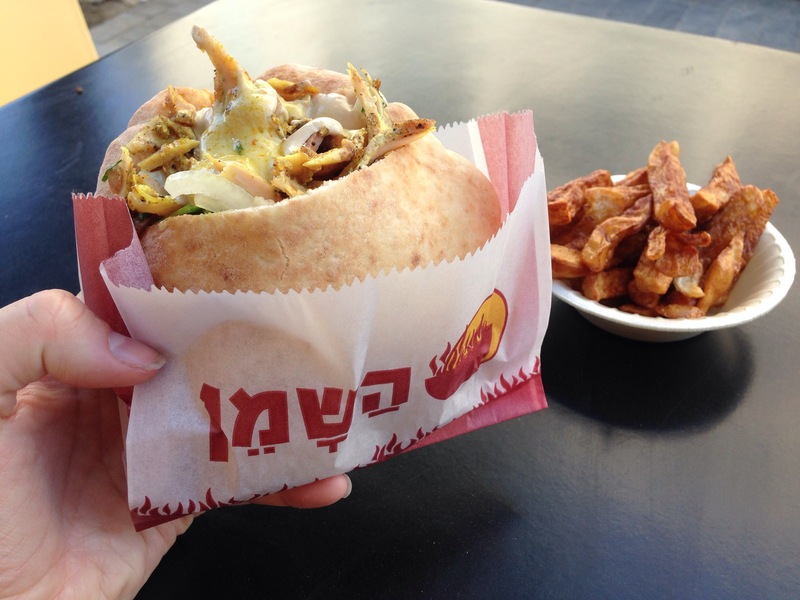 Shawarma is similar to the gyros of Greece and the doner kebabs brought to Germany by Turkish immigrants. I feel like I’ve had the trifecta of slow-roasted meats cooked on vertical spits (shawarma is actually the meat, not the sandwich, though they often mean the same thing. Shawarma comes from the Turkish word çevirme, meaning “to turn”). I can’t say which is best; they all have their distinct tastes and flavors. Especially since the bread is slightly different in all three places. Here, the ash-tanur bread is baked in a tabun oven, which is an ancient clay oven used throughout the Middle East. The flavor is incredible. 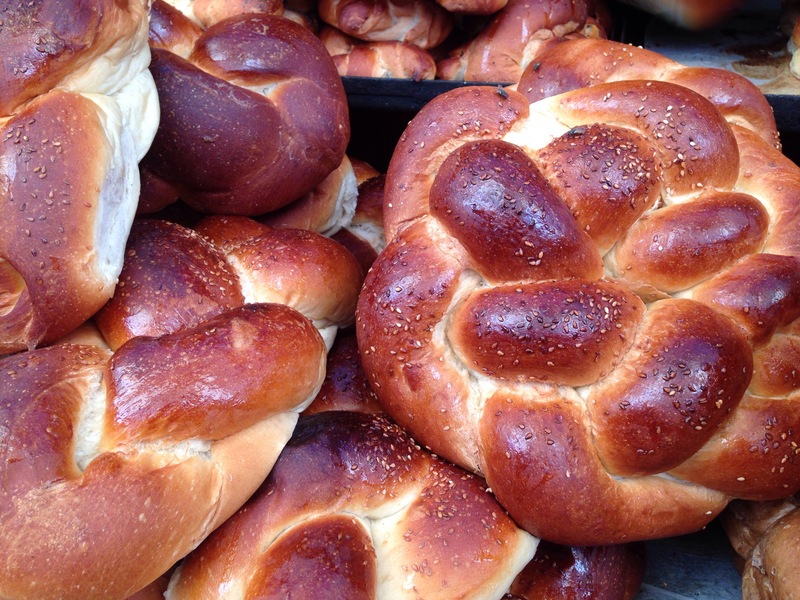 Challah’s design is significant: loaves are typically woven with six strands, and when the two loaves on shabbat are together, they signify the twelve tribes of Israel. (Of course, some loaves are made with more/less strands, but the six+six is symbolic.) Two loaves are used on shabbat to represent the double loaf that fell from the sky during the time Israelites wandered the desert just before shabbot, since no bread was delivered on the Sabbath. We spent a good deal of time in the Machane Yehuda, this glorious market selling everything you need for the modern Israeli kitchen. There, I found חלבה (halva) and lots of it. 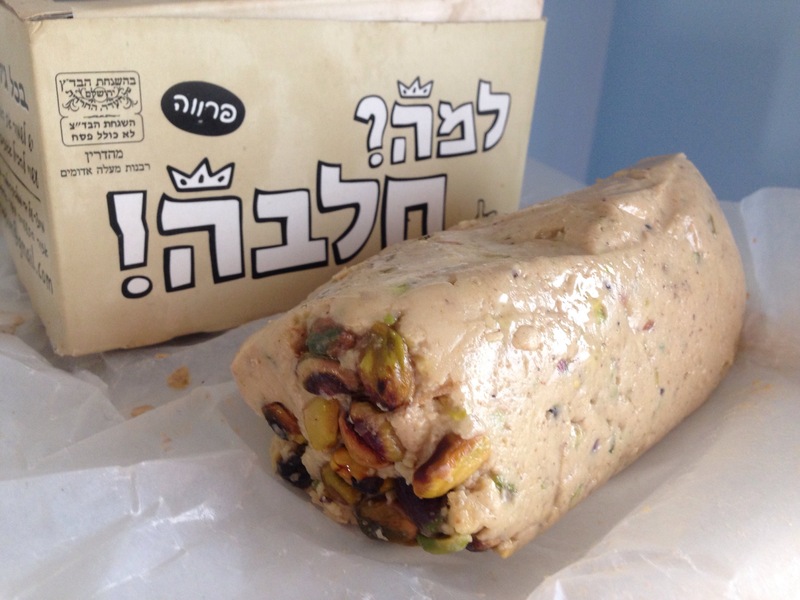 Halva also is reinterpreted all over the world and can differ significantly. 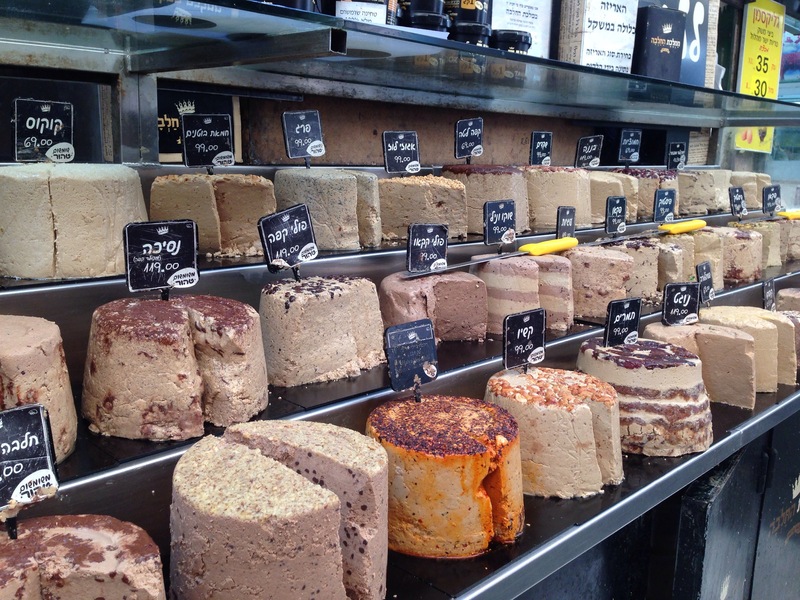 You may remember the flour-based halva I had in Greece not long ago, which had thrown me for a loop since I have always associated halva with the rounds of sweet tahini confections we saw, sampled, bought, and are still eating in Jerusalem. In Israel, the halva base is heavily sesame flavored, and other nuts/spices/fruits/etc are thrown in to give it a distinct flavor. We sampled so many such as coffee, chocolate, cranberry… and ended up with a fantastic pistachio halva. It is so delicious, but rich so you can only eat a small bite of it at a time. 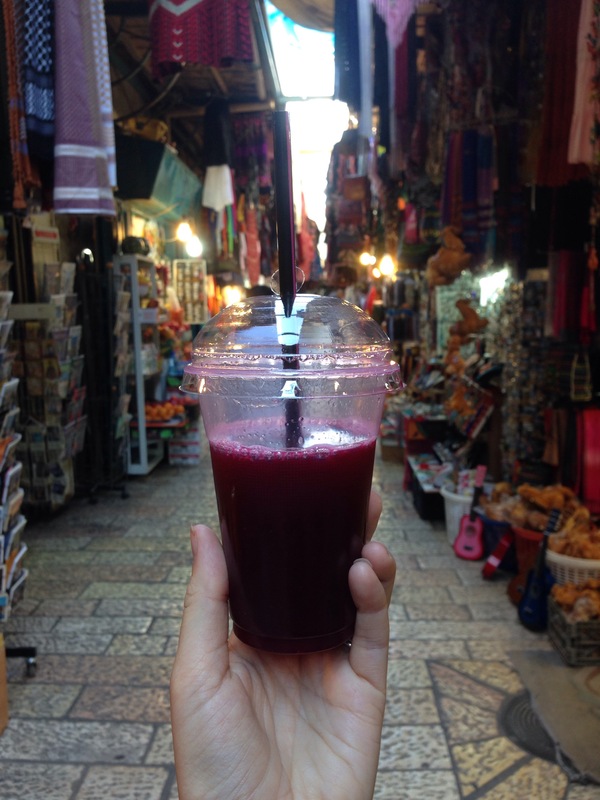 Through the Muslim Quarter of the Old City, and also elsewhere, you will not have to walk far to see fresh squeezed juice stands, juicers standing among pallets of oranges, pomegranates and other fruits. I chose pomegranate, because who doesn’t want freshly squeezed pomegranate juice while walking around in 100-degree weather. Pomegranates were originally cultivated in Iran–it’s one of those rare plants that thrives in arid lands–and have been both a practical and symbolic part of the Mediterranean life for millennia. I enjoyed it while strolling through the market to admire shop after shop. 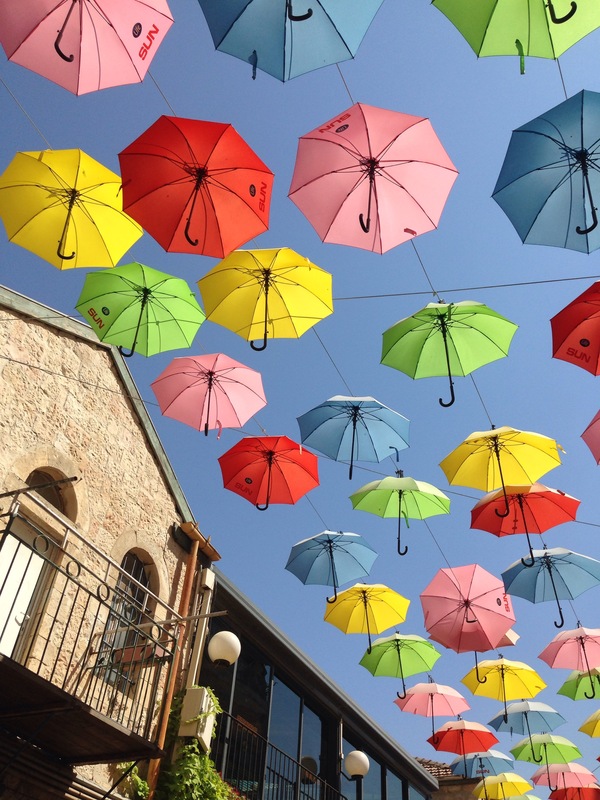 Not a bad way to spend your time in Jerusalem. * What is Levantine food? Food from the Levant, aka Eastern Mediterranean area, aka mostly Syria and Lebanon, but more broadly, also: Egypt, Israel/Palestine, Jordan, and sometimes Turkey and Iraq. And sometimes Greece.